Telephone the doctor: When someone dies at home, the first contact should be with the deceased’s doctor who, if satisfied with the cause of death, will issue the Medical Certificate of Death. In some cases you may be asked to collect the certificate from the surgery. In the case of a nursing home death, their staff should liaise with the doctor. After informing the doctor, you can contact us here at Revel Funeral service and we will arrange a suitable time, day or night, to visit you to discuss the funeral arrangements and bringing the deceased into our care. Bereavement Services Department will see you if death occurs in hospital. They will arrange for a doctor to issue the Medical Certificate of Death. You will need to collect this and any belongings. If the funeral is to be a cremation, please advise the hospital staff to enable them to make arrangements for any additional documentation that is needed. Contact Revel Funeral Service and we will arrange a suitable time, day or night, to visit you to discuss the funeral arrangements and bringing the deceased into our care. Is a post mortem required? Occasionally a doctor may ask for a post mortem examination to be carried out, in order to understand more clearly what happened, and to clarify the cause of death. If the doctor wishes to carry out a post mortem, they must ask for your permission. If this should be the case, someone will talk to you about it usually before you leave the hospital. When someone dies unexpectedly, it is normal for the Coroner (England and Wales) or Procurator Fiscal (Scotland) to be involved. There are many reasons why this can happen, for example the Coroner/Procurator Fiscal is automatically involved in most sudden or unexpected deaths, especially if the deceased has not been under a doctor’s care on a regular basis, the emergency doctors, or any police involved will inform the relevant Coroner’s office or the Procurator Fiscal. Contact Revel Funeral Service as soon as possible. We can advise on the procedures involved and liaise with the Coroner’s/Procurator Fiscal’s office. When someone dies, the doctor, hospital GP or sometimes the coroner, has to issue a certificate giving the cause of death before the death can be registered. If the doctor at the hospital is able to issue a certificate, you will need to return to the hospital and collect it. It is a common misconception that the issuing of a cause of death certificate is just obtaining a signature on a piece of paper. Unfortunately it is not as simple as that; certain criterion needs to be met in order for this legal document to be issued. In the majority of cases only a doctor who has treated the patient in the last 14 days before death can issue the cause of death certificate. Although every endeavour to complete cause of death certificates as quickly as possible is taken circumstances may delay this process on occasion, please telephone the numbers below at the appropriate times. 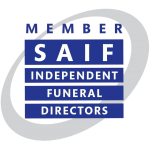 We will ask you where you would like the deceased to rest before the funeral. This can be at our funeral home or at your home if it is safe to return them. If you choose your home, we recommend that you allow us to bring the deceased into our care, to be returned home at a later time when all necessary preparations have been completed.